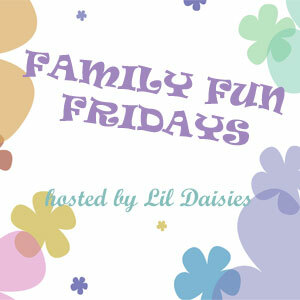 It is Lil Daisies first official party Family Fun Friday! Yay! In honor of this being the first week, we will be having a giveaway! For everyone that enters into this event (over the next two weeks) by sharing about their Family Fun will be entered into the giveaway. 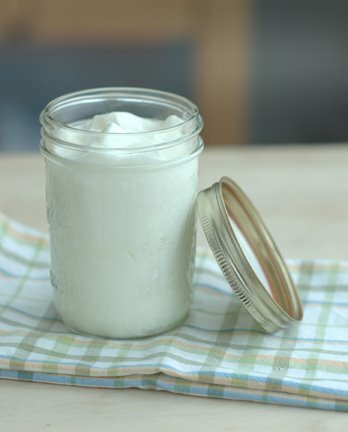 You can share with us in a blog post on your blog or for those of you that don't have a blog, can share in the comments section below! Want to know what you can win? 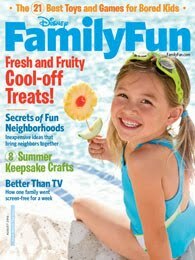 A subscription to Family Fun Magazine. For our Family Fun time, we enjoyed a morning treat by having a picnic breakfast outside. My girls love to have picnics -- having a meal with a twist and out from the ordinary kitchen table. We laid out a picnic tablecloth on the lawn in our front yard. (I was going to do the backyard, but Mallie, our dog, had made a mess out there the past few weeks). We enjoyed our picnic for about 20 minutes before the hot Summer heat drove us indoors to finish our picnic on the living room floor. It is your turn. Share with us some of your family time. What did you do this week? Link your blog here to Lil Daisies and/or leave a comment telling us what you did. We celebrated our Family Fun Friday by heading to Tybee Island Beach (Georgia) for the afternoon. We laid in the lukewarm water of the Atlantic and soaked up the last of the summer rays before everyone heads back to school. The breeze was perfect and we chatted with friends and caught up on old times while the kiddos played in the surf. Afterwards we headed to a local hangout that is appropriately named the "Sugar Shack". The best ice cream on Tybee Island and known for their island atmosphere. Don't expect to rush you are here to enjoy your Coffee Almond Fudge as it drips down your cone in the humid southern air. You sit there, gritty from the sandy on the beach, salt from the water, smelling something like Jonah while kiddos munch on french fries and parents catch up on plans for the next get together. Yes, Fridays are full of fun for our family. Love this post!!!! You picnic looks soo yummy! New follower from friendship friday! My sister came down yesterday and stayed overnight, so we had a little extra family today! This morning, the hubbs and my sister went to breakfast at a beachfront cafe while Tessa and I were very disciplined and went to our Mommy and Me work out! We spent the rest of the day just hanging out together as a family, practicing sitting and rolling over, and all the other "tricks" Tessa is working on. Not too exciting, but it is precious time, since the hubbs works clear across the state and is only home on some weekends.